We forgive you for not checking out last night's SAG Awards. Between the Golden Globes, the Oscars, and the Grammys, Sunday nights are already packed with award shows to watch -- not to mention Young Popes to observe -- and the trophies given out by the Screen Actors Guild aren't exactly the most memorable. But one thing made the show worth sitting through: Winona Ryder's incredible faces. The Heathers star took the stage Sunday night to collect the trophy for Best Ensemble in a Dramatic Series with David Harbour (a.k.a. Chief Jim Hopper) and the rest of the cast of Netflix's breakout summer hit Stranger Things. While Harbour provided some sobering and inspiring thoughts about the power of acting (and the benefits of punching evil in the face), Ryder stole the show with facial expressions that ranged from quizzical to nervous to defiant. With only her eyes, she provided all the highs and lows of a highly bingeable Netflix series. Forget Emma Stone in La La Land or any other Oscar hopeful: this is a real performance. If there was an awards show for awards shows, Ryder would surely win Best Supporting Faces in an Ensemble Speech. It's that commitment to her craft that has made the actress such a welcome presence on red carpets this year, and it's also part of what's made her such a reliable GIF-provider. As Harbour said in his speech, "great acting can change the world." 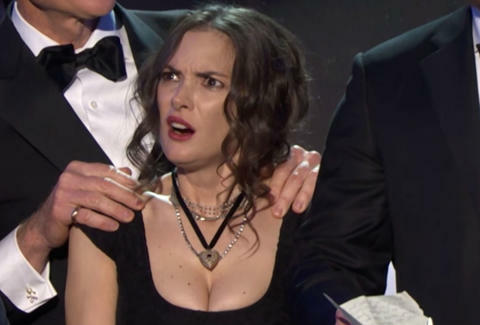 It's a true sentiment -- and a comfort in these dark, uncertain times -- but let us not forget that the same is true of awards show reaction shots. Salute to Winona. Give her all the trophies. Dan Jackson is a staff writer at Thrillist Entertainment and he wants to know why the demogorgon wasn't invited onstage. He's on Twitter @danielvjackson.